The Indonesian Pulp and Paper industry contributes an estimated 5.6 billion US Dollars per year to the national revenue. One of the largest pulp and paper producers in Indonesia is Riau Andalan Pulp & Paper (RAPP), a subsidiary of Asia Pacific Resources International Holdings Limited (APRIL) founded by entrepreneur and philanthropist Sukanto Tanoto. Sukanto Tanoto is also founder of Sateri and Pacific Oil & Gas. With the completion of the construction on its third paper mill in Pangkalan Kerinci, Riau, it is poised to be the second largest paper producer of the world. RAPP’s two existing paper mills have the combined capacity to produce 850 000 tons of paper per year; however, with the completion of the additional third mill completed in 2017, production is estimated to increase to a combined 1.1 million tons per year. These projected figures will make RAPP one of the largest paper producers in the world, second only to International Paper, a paper producer from the United States. A cut to size paper such as the international A4 size. A shaped folio, which is a large sheet of paper. The international markets expand to 75 countries, which include the Middle East, Japan, Australia and India. With the new production capacity in 2017, RAPP is expecting to export up to 10 000 tons of cut to size paper every month to India. According to Assistant Communications Manager of RAPP, Budhi Firmasyah, testing had already begun on the new plant in November 2016, and production is expected to begin at the end of January 2017. In addition to becoming the world’s second largest paper producer, RAPP is ranked the 9th largest producer of pulp, with a production reaching 1.2 million tons of pulp in 2016. Of the 1.2 million tons produced, only 20% was used domestically for the production of paper in their own factories, the rest was exported to over 20 countries. Royal Golden Eagle (RGE) is founded by Indonesian entrepreneur and philanthropist Sukanto Tanoto. From its humble beginnings in 1973 it has grown into a large, successful global group of resource-based manufacturing companies. Sukanto Tanoto started his empire with the family business supplying spare parts to the Indonesian construction and oil site industries. In 1972 he won contracts to build gas pipelines, and following the 1973 oil crisis the business grew considerably. This gave him the liquidity to start up a new business venture in the shape of a plywood mill situated in Indonesia, after noticing that there was a gap in the local market. Up until then raw wood logs were exported to be turned into plywood, before being imported back into Indonesia, which was a very costly endeavour. In 1979 RGE diversified into the palm oil sector, creating Asia Pacific Resources International Holdings Limited (APRIL). Since 1997 Sukanto Tanoto has expanded manufacturing operations in Indonesia, China and Brazil, corporate offices in Singapore, Hong Kong, Jakarta, Beijing and Nanjing, and sales offices around the world. The RGE group of companies is involved in various business segments: energy resource development, pulp and paper, palm oil, speciality cellulose and viscose staple fibre. Chairman and founder of RGE, Sukanto Tanoto, implemented a fourth part to RGE’s existing business philosophy – Climate. Pacific Oil & Gas gave the greenlight on the US$ 1.6 billion Woodfibre LNG project in Canada. LNG Woodfibre received environmental approval of the Canadian Government. Bracell completed a US$ 1.1 billion privatisation exercise and became a part of the RGE group. APRIL received PEFC certification and joined PEFC as an international shareholder member. 2016 saw RGE group of companies member, the APRIL group host a visit by none other than Professor Mahbubani and his colleagues. The group was visiting regions such as the Kampar Peninsula and the APRIL group’s pulp operations, as well as the eco-restoration project, a mission held in very high regard by APRIL group founder and entrepreneur, Sukanto Tanoto. Additionally, the Professor and colleagues also had the opportunity to visit and tour community development sites and schools supported by RGE and the Tanoto Foundation. As a Professor in the Practice of Public Policy and the Dean of the Lee Kuan School of Public Policy in Singapore, Kishore Mahbubani is a highly esteemed expert in his field, also having served 33 years in Singapore’s diplomatic service. As such, Professor Mahbubani is well known as an expert in both Asian and world affairs. It was a great honor for the RGE group of companies and its founder, Mr. Tanoto, to host Professor Mahbubani and his colleagues, and their observations and reflections regarding RGE were well received. Professor Mahbubani reflects on his visit; ‘The visit achieved two objectives I had set for my team and myself. ‘I was heartened to see that RGE took its environmental responsibilities very seriously. Its sustainability programme is professionally managed, and it seeks to adopt the highest standards in the paper and pulp industry. It also engages environmental NGOs and local communities quite intensively. I was also struck by the efforts taken by RGE to prevent fires from occurring – the Fire-free Village Programme is one of those rare ideas that is good for the environment, for the business, and for the local community. I hope this programme can be implemented more widely in the Riaus. ‘While RGE is clearly a very successful and well-managed company, and its rapid growth has clearly “spilled over” to the nearby town of Kerinci, the fact remains that there are too few of such success stories in Indonesia. Follow the founder of APRIL, the RGE group of companies and the Tanoto Foundation, Mr. Sukanto Tanoto, via social media on Facebook, Twitter, Tumblr or LinkedIn for more updates. To face the challenges of tomorrow, Southeast Asia’s brightest young people should be encouraged to take an interest in urban planning and design. The APRIL group’s support of the CUBE competition is helping to realize pioneer and philanthropist, Sukanto Tanoto’s vision of widespread education in all spheres of knowledge. 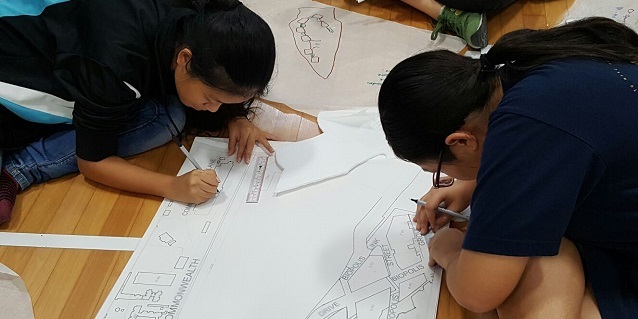 Every year, the Challenge for the Urban and Built Environment (CUBE) draws students from Indonesia, Singapore and beyond to learn about urban planning and transform a town as their main project. The APRIL group, an RGE company founded by entrepreneur Sukanto Tanoto, is one of CUBE’s Platinum Sponsors. Through the Tanoto Foundation, Sukanto Tanoto, RGE’s founder and one of the foremost business leaders in Indonesia, has always placed learning, intellectual curiosity, and community outreach at the core of his values. By supporting CUBE, APRIL is doing its part to make Mr. Tanoto’s vision a reality across the region. Large-scale urbanization and rapid growth create dynamic economies and expanding cities – and this presents a challenge to urban planners and designers in the region. In keeping with Sukanto Tanoto’s vision of a business that benefits people, environment, country, and company, APRIL believes that its sponsorship of the CUBE challenge will have long-reaching effects. The success of CUBE and similar projects will help to produce future professionals and leaders who are conscious of the social and economic challenges around them – not only for themselves, but for the entire community. To find out more about Sukanto Tanoto’s philanthropic activities, we invite you to follow him via social media on Facebook, Twitter, Tumblr, About.me or LinkedIn.